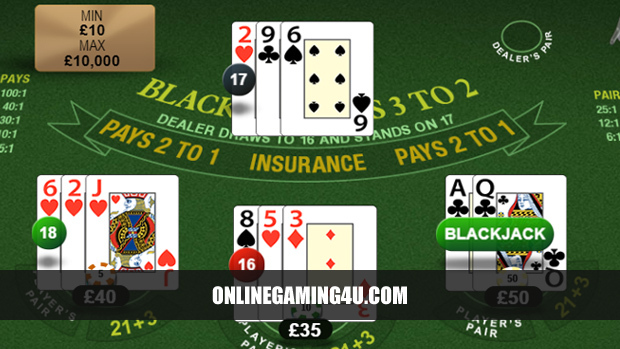 Blackjack is one of the most popular and famous card games played all over the world. It is also known as other names such as Pontoon or Twenty-One. Aside from luck, blackjack players can also have the skill and the ability to count the value of the cards and anticipate what card will come next. Twenty-one is the exact value that your cards must reach in order to win. If getting the value of 21 is not possible, players must have a value that is as close to 21 compared to the value of cards held by the dealer. If neither player hits an exact 21 match, nearest total wins. If both the player and the dealer total the same number, the game is a draw, also known as a ‘Push’. In the event of a Push, the stake is returned to the player. One of the main blackjack rules is to know the value of the cards. From number 2 to 10, the cards have the same value as the card numbers. The Jack, Queen, and King are considered to have the value of 10. Whereas, the Ace may either have the value of 11 or 1. If a player receives an Ace then it is up to them to choose the value that suits their hand best. Although the rules of blackjack sometimes vary from one casino to another, the general rules are standard across the industry. 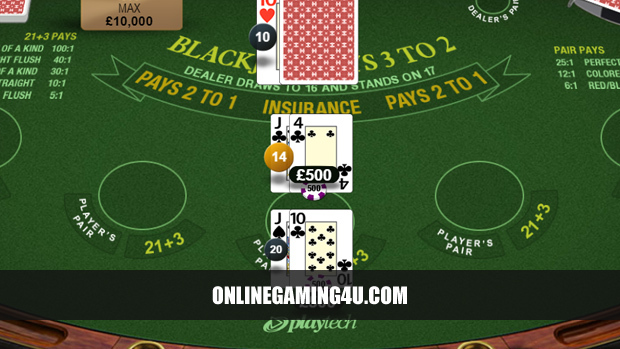 See our dedicated blackjack section for a list of blackjack casinos in the UK. First of all, players who will be participating in the game must place their bets before the cards are dealt. If the game is already in play, you will have to wait until the current ’round’ of blackjack finishes before placing bets. To place a bet, a player puts their chips down on a circle or position that indicates their position on the blackjack table. Casinos often have minimum and maximum stakes per hand when playing. 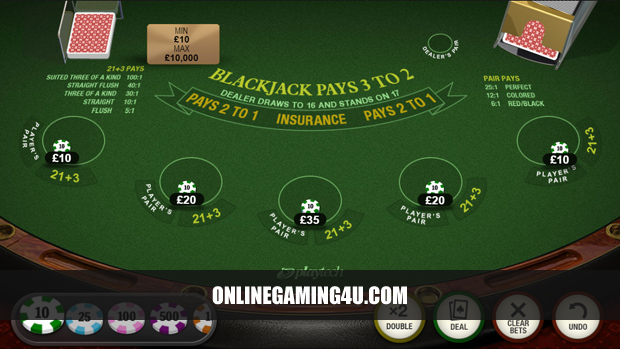 In blackjack, there are 3 main ways to play; in a local casino venue, a virtual game online or live blackjack. Virtual games are generally played with just one real player and one computer player, aka the ‘house’ dealer. Some virtual games also allow players to play more than one hand. These games are called multihand blackjack. Blackjack games played in an actual casino or live via the internet are often not played alone. Other real players can play at the same table at the same time. When it comes to dealing, once all players have placed their bets, the dealer will start distributing the cards. This must start from the left player going to the right. The dealer will then give each player two cards only. This is known as your ‘hand’. More often than not, the players will receive the two cards facing up. Whereas the dealer will get one card facing up and the other card facing down. The card that is face-down is also known as the hole card. If you are playing blackjack in casinos, sometimes the dealer will not receive a hole card to avoid a player spotting their complete hand. Instead dealers will only receive their second card when all other players have finished. Again, starting from the player situated at the dealers left first, the players will decide if they will have to get more cards (called a ‘hit’ or ‘twist’) in order to get 21 or as near to. They may also opt to refuse additional cards (called a ‘stand’ or ‘stick’) as well. The players can ask for as many cards as they want until they have reached the value of 21. Once the players from left to right have completed their turns, it is now time for the dealer to take theirs. There are certain rules that the dealer must follow when playing blackjack. If the value of the cards within his or her hand has already reached a specified number, such as 17 or more, the dealer must refuse to get additional cards and must stand. Depending on the game being played and the casino, this minimum value varies from 15 and 16 to 17. On the other hand, if the value of the dealers cards is 16 or less (where the minimum is 16), he must still take additional cards or hit. 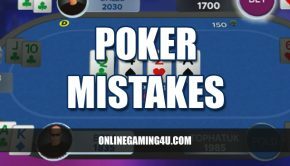 Note: some players choose blackjack games that have a lower minimum dealer stand to give them more room to maneuver when thinking about taking more cards. At the end, the winner of the game is the player holding the cards closest to 21. If your hand exceeds 21 then you are out of the game-round, also known as ‘bust’. There is no need to keep track of the value of the cards of the other players. All you need to do is to compare the value of your card against the dealer to determine whether you win the game or not. However, some players try and predict what cards will be dealt next based on the hands that have already been drawn. 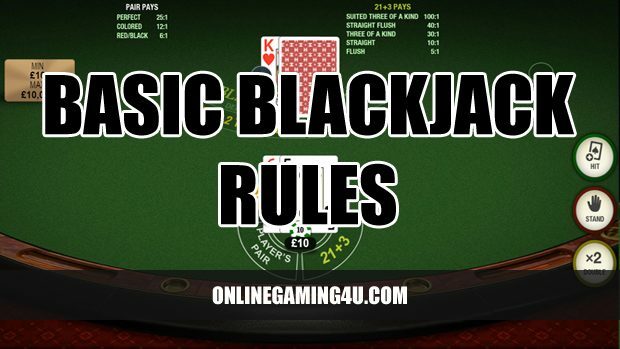 These are the basic rules of a standard blackjack game. 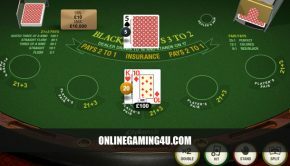 There are also other aspects of the game such as splitting, double down and insurance. 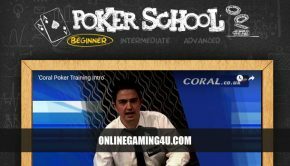 Search online for each term followed by the word blackjack for in-depth information on each and how they affect your game. In brief; splitting refers to a player who is able to split their initial hand in 2 and play two separate hands against the dealer. Effectively playing two games parallel to eachother. Neither split hands affects the other cards. A player can only choose to split if the first 2 cards they are dealt are the same, e.g. 6/6, 10/10, Jack/Jack etc. Note: when splitting, the game is split in 2, which means that your initial stake will also apply to the second hand. For example, if you originally bet £5 and choose split, your total stake will be £10 – £5 for each of the split hands. Double Down means that a player can double their initial bet after receiving their hand. However, in some casinos you can only choose to do this if the first 2 cards total nine, ten or eleven. This works by doubling your stake and receiving one more card only from the dealer. The perfect double down situation would be that a player is dealt a initial hand of 5+6, giving them a total of 11. They then double down and receive a Queen (or other 10 card) giving them a double down total of 21 across 3 cards. Insurance is available during some rounds of blackjack. This option only appears when the dealer receives a first card that allows them to get blackjack (21). 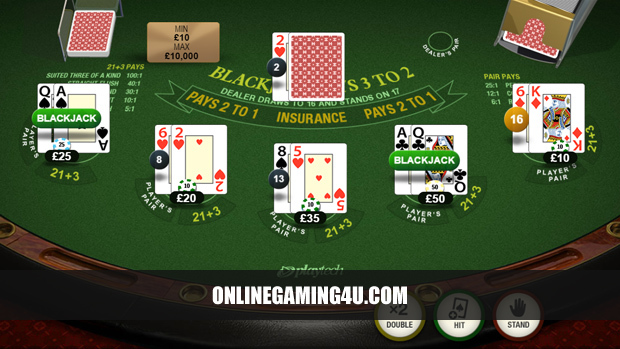 If, when the cards are dealt the dealer receives an Ace or Jack for example, insurance will be available to the player. If a player takes the insurance bet then they will win if the dealer then turns the Hole card over and it reveals blackjack. First published July 20th 2009. Updated 17th October 2017.